With the curtain going down on Stephen Langridge's Royal Opera production of Parsifal after last night's cinema relay, we've films from recent ROH Insight events for you to enjoy. Conductor and Music Director of The Royal Opera Antonio Pappano introduced the music of the opera with the help of guests Gerald Finley and Simon O'Neill. 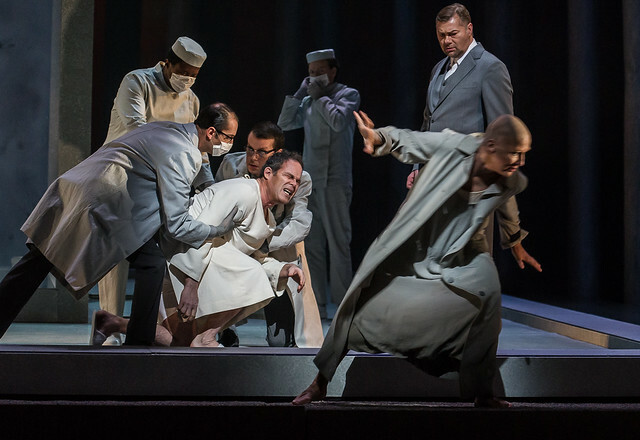 Legendary Wagnerian John Tomlinson coached tenor Neal Cooper in the final scene of Act III, where Parsifal heals Amfortas with the Holy Spear. John has been acclaimed for a number of Wagnerian roles including Wotan in the The Ring Cycle, and Gurnemanz in Parsifal. Parsifal's director Stephen Langridge and designer Alison Chitty had collaborated previously at Covent Garden on The Minotaur, which had its premiere at Covent Garden in 2008. The creative team spoke about the process of working on Wagner's final masterpiece, which began two and a half years before opening night. They also spoke of how attempted to convey Amfortas's intense suffering, intended by Wagner to be great as Tristan in Tristan und Isolde, multiplied of 10. Find out more about upcoming ROH Insights events. The Royal Opera House has just launched a Wagner appeal, which raises funds to keep Wagner’s operas alive. I was at the recent Parsifal Insights event from which this Director/Designer chat clip is taken. But in fact most of that evening was taken up with a wonderful account of the opera by Tony Pappano, and this was filmed as well. Any chance this could be posted (uncut) on YouTube? The world deserves to see this. Thanks for your comment. We've added an edited version of film above and hope you enjoy watching it. Thanks, too, for adding Mr. Pappano. I watched a broadcast of Parsifal in a movie theatre last week in USA. It was my first time to see this opera. I am pleased that it was this production. Only recently a Wagner fan (I couldn't bear all that bellowing - sorry for the sacrilege!) but listening to Jonas Kaufmann's views on Wagner & great performances and Pappano's wonderful insights have opened up a whole new magical 'box of delights' for me.